Assess the relationship between the US and Iraq from 1970 to the present day. 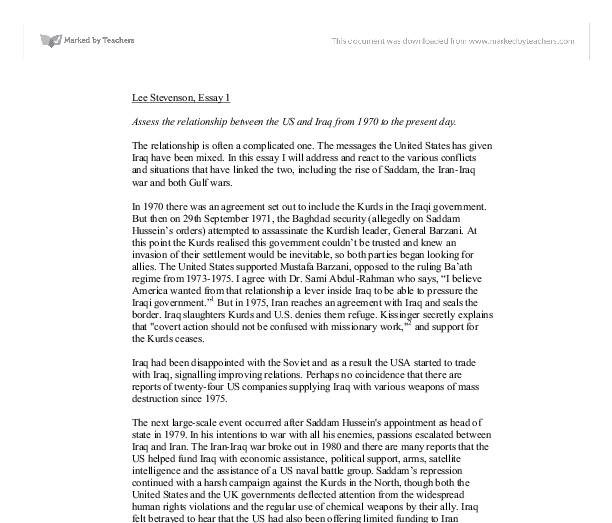 Lee Stevenson, Essay 1 Assess the relationship between the US and Iraq from 1970 to the present day. The relationship is often a complicated one. The messages the United States has given Iraq have been mixed. In this essay I will address and react to the various conflicts and situations that have linked the two, including the rise of Saddam, the Iran-Iraq war and both Gulf wars. In 1970 there was an agreement set out to include the Kurds in the Iraqi government. But then on 29th September 1971, the Baghdad security (allegedly on Saddam Hussein's orders) attempted to assassinate the Kurdish leader, General Barzani. At this point the Kurds realised this government couldn't be trusted and knew an invasion of their settlement would be inevitable, so both parties began looking for allies. The United States supported Mustafa Barzani, opposed to the ruling Ba'ath regime from 1973-1975. I agree with Dr. Sami Abdul-Rahman who says, "I believe America wanted from that relationship a lever inside Iraq to be able to pressure the Iraqi government. "1 But in 1975, Iran reaches an agreement with Iraq and seals the border. Iraq slaughters Kurds and U.S. denies them refuge. Kissinger secretly explains that "covert action should not be confused with missionary work,"2 and support for the Kurds ceases. Iraq had been disappointed with the Soviet and as a result the USA started to trade with Iraq, signalling improving relations. ...read more. The US and UK often hindered Iraq's rehabilitation by using its veto power in the UN to prolong sanctions and no-fly zones. They also stopped Iraq from acquiring equipment that could be deconstructed and used to build military equipment, known as 'dual-use'. Of fifteen Council members, two often used their power to put selected imports on 'hold': the US and the UK. In July 2002, $5.4 million6 in contracts were on hold, the majority imposed by the US. Unconvincingly the US is inconsistent in what it will allow to pass. On one occasion it may hold something of dual-use that another day it may be happy to give to the same company requiring it. It is this inconsistency that depicts the US as trying to be problematic, to suppress Iraq. Less than 60% of orders purchased from oil sales have actually arrived in Iraq since December 1996, seriously stunting repair to Iraq's deteriorated infrastructure, including water treatment, electricity and public health. This really undermines the credibility of the sanctions applied on Iraq. It is as if the US doesn't even want to see Iraq recover economically, yet they have no real reason. The Security Council could be in violation of its responsibilities for not closely monitoring the state of humanity in Iraq when the sanctions were applied. And realising that the system was not for them, the US did encourage so-called 'Smart Sanctions' that would target the leaders and not the Iraqi people, preventing them international travel and freezing their assets. ...read more. The US has had ample opportunity to remove him, yet they decide not to because they don't know how a post-Saddam Iraq would work. As one leader of the Iraqi opposition said, "They want Saddamism without Saddam," a dictator without the massacre. Instead they cooperate with other countries as they attempt to remove him, but without the US arsenal, this is never going to be easy, and the possibility of revolution is small. As always though the US acts in its own interests, and the more the current conflict evolves, the easier it is to hypothesise that it is the wealth of oil that is driving the conflict. Footnotes 1 Dr. Sami Abdul-Rahman is Deputy Prime Minister and member of Kurdish Democratic Party. 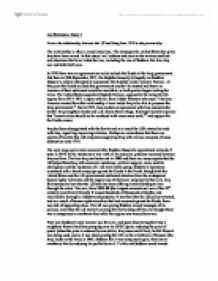 Interview from http://www.pbs.org/wgbh/pages/frontline/shows/saddam/interviews/rahman.html 2 U.S. House of Representatives, Select Committee on Intelligence, 19 Jan. 1976 (Pike Report) in Village Voice, 16 Feb. 1976. The Pike Report attributes the quote only to a "senior official"; William Safire (Safire's Washington, New York: Times Books, 1980, p. 333) identifies the official as Kissinger. 3 Transcript from interview between Saddam Hussein and US Ambassador to Iraq, April Glaspie, July 25th 1990. Available at http://www.whatreallyhappened.com/ARTICLE5/april.html 4 New York Times, August 16, 1990. 5 Resolution 986 6 See Office of the Iraq Programme, weekly update, www.un.org/Depts/oip/latest/wu020521. 7 New York Times, September 12, 2002. Reference Material Books The Gulf Conflict and International Relations (Ken Matthews, 1993) Iraq - a Country Study (US Library of Congress, 1988) How Bush got the brink (Peter Pringle, 1991) Web http://www.pbs.org/wgbh/pages/frontline/shows/saddam/interviews/rahman.html http://www.zmag.org/shalomhate.htm http://www.zmag.org/content/showarticle.cfm?SectionID=15&ItemID=2766 http://globalpolicy.igc.org/security/sanction/iraq1/2002/paper.htm#4 http://www.whatreallyhappened.com/ARTICLE5/april.html http://usinfo.state.gov/regional/nea/iraq/chron.htm ...read more. Many Arabs see this as American money used to kill Muslims in return for oil. One key factor to this was the creation of Israel. It was created by giving Palestinian land to the Jews. When the Jewish state was created in 1948, five Arab nations had already created a coalition which was determined to destroy the new state. Consequently a major split in international opinion was established by U.S.A. and U.K. with Spain at first for the invasion and Germany, France, Russia, China with Spain coming later were against it. it grants immigrant status to individuals who are not ethnically Jewish but are related to Jews. Another law, which is clearly affected by the state religion in Israel, is "The Nationality Law". (Mingst and Karns 2004) Such examples are also presented by the condemnations against Israel. Following repeated condemnations on Israel for its policies and after "establishing the Special Committee on Israeli Practices in the Occupied Territories to report to the General Assembly on Israeli abuses, Israel remains defiant." East, Iran and US relations have not be good to say the least. Iran sees the United States as a very serious and powerful enemy. Israel and the United States also have a heavily intertwined alliance, Israel benefits largely from US security help as well as economic help. The Geography and History of Iraq. It is used to make a variety of dishes, the palm is used for weaving and date pits are ground to create a beverage. Fauna The country has little fauna in relation to its size. Mostly, individuals keep camels as they survive very well in deserts.